Before there was Multistrada there was ST2, Ducati’s first sport-tourer with saddlebags, and it was good. Strangely, the apostle Tom didn’t have much to say. Happy 21st birthday to her anyway. Amen. Ducati’s long-awaited entry into one of the fastest-growing segments in motorcycling was finally introduced to the U.S. market this month with the formal unveiling of their 1998 ST2 sport-tourer in Santa Barbara, California. Ducati’s ST2 is intended to take the best of the Italian firm’s traditional high-performance heritage, along with their distinctive styling elements, and turn them into an ultimate, yet comfortable sport-touring machine. Housing one of Ducati’s latest 90-degree desmo V-twins, the ST2 comes equipped with the usual assortment of touring creature comforts: Raised handlebars, softer springing and damping rates, and a larger, better padded dual saddle. ST2 cockpit features higher bars and combination analog and LCD digital gauges. The ST2’s chassis is one of Ducati’s familiar tubular trestle frames that is similar to the 916’s in torsional rigidity and lightness. Anchored to the steering head is a pair of 43mm Showa inverted forks that feature full adjustability, while the rear is held up by a single shock borrowed from the 916 and reworked for the ST2’s status as a two-up touring machine. Front brakes feature twin 320mm floating Brembo discs and four-piston calipers, offering excellent feel and power. At the rear you’ll find a single 245mm disc with a twin-piston caliper that we found gives poor feedback. The ST2 wears Metzeler’s latest MEZ4 sport radials in 120/70 ZR17 front and 170/60 ZR17 sizes. Nestled in that steel spider web frame is Ducati’s newest version of its 90-degree, liquid-cooled V-twin engine, enlarged to 944cc for duty in the ST2. SOHC, 2-valve desmo heads, similar to the set-up found on Ducati’s early Paso models, are employed on the ST2 mill. Combined with 10.2:1 compression and Marelli electronic fuel injection, Ducati claims an output of 83 hp at 8500 rpm.Besides the strong V-twin powerplant, ergonomics are another strong point for the ST2. Its slightly forward seating position, lower footpeg placement and taller handlebars seem to strike a nice balance between full-on sport riding and touring comfort. The dual saddle is quite large, and we found it provided enough room for two-up travel. The lockable hard bags appeared to offer enough luggage space for a weekend trip for two, but we could not fit a full-face helmet in either bag, as Ducati claims you can. The color-matched bags are attached with a system similar to BMW’s touring luggage, and can be removed from the bike with ease. 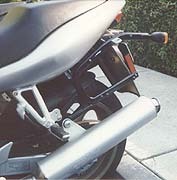 Ducati incorporated a trick design feature with the bags that allows you to raise the exhaust cans for more ground clearance when the bags are removed. Nice touch. Ducati said the ST2 should be priced around $12,000 and be available in the U.S. by October 1st (except in California, where expected availability won’t be till December). Our brief ride aboard the ST2 around Santa Barbara’s tight, twisty city streets revealed a quick steering bike that could be flicked over with ease, despite the added weight of its touring gear. 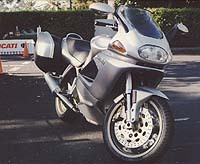 Of course there was that unmistakable feel and torque of a Duc desmo V-twin, with an extremely comfortable two-up riding position that should lend itself well to sport touring. We didn’t have an opportunity to exploit the larger engine’s power, but we plan on nabbing an ST2 test bike soon to put through its paces and face it off against a couple other twin-cylindered sport-tourers. Stay tuned. Claimed dry weight: 466 lbs.